I NEVER thought I’d ever get to see what the Arctic ice cap looks like from the bottom up. It’s quite stunning — blocks of blue ice tumbling around in a frigid sea amid giant, jagged ice stalactites. I was afforded that unique view while surfacing from beneath the Arctic Circle last weekend aboard the U.S.S. New Mexico, an attack submarine. I had spent the night on the sub as part of a group accompanying Adm. Jonathan Greenert, the chief of naval operations, who was observing the Navy’s submarine arctic warfare exercise. We had flown into the Arctic by small plane and landed on a snow airstrip at the Navy’s ice research station Nautilus, 150 miles north of the North Slope of Alaska. When we got there, the New Mexico, which had been patrolling the waters below, had already found an opening of thin ice and slushy water. The sub used its conning tower, or sail, to smash through to the surface, then “parallel park,” as one officer put it, between two floating islands of thick ice, and pick us up. As we slipped back under water, the ship’s upward-looking camera (specially installed for underice travel where you can’t raise the periscope) carried a view of all the ice that had frozen around the sub in its few hours on the surface, which then cracked into huge chunks as we headed down. With the sub’s officers constantly checking the sonar and camera — and barking out speeds and directions to the two pilots steering the sub with a joystick and digital readouts that glowed in the dark control room — we gently submerged. The trick was to avoid the ice keels — forests of ice stalactites that extended down from the thicker surface ice into the arctic waters. Once we safely descended about 400 feet, we proceeded on our way. 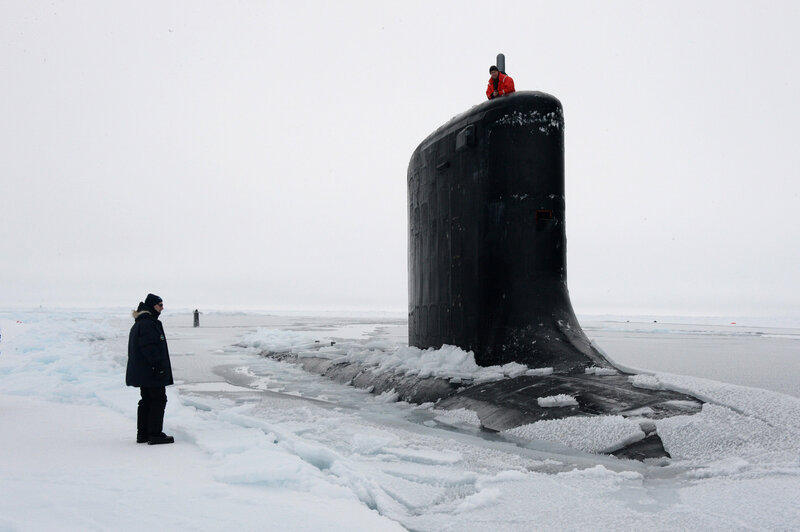 Watching these officers maneuver an 8,000-ton nuclear sub, 377 feet long, through islands of unstable Arctic ice — we surfaced the same way — was a breathtaking and breath-holding experience. But this wasn’t tourism. Climate scientists predict that if warming trends continue, the Arctic’s ice cap will melt enough that — in this century — it will become a navigable ocean for commercial shipping year round, and for mineral and oil exploration. Russia has already made extensive claims to the Arctic, based on the reach of its continental shelf, beyond the usual 12 miles from its coastline; these are in dispute. To prepare for whatever unfolds here, though, the U.S. Navy keeps honing its Arctic submarine skills, including, on our trip, test-firing a virtual torpedo at a virtual enemy sub, studying how differences in water temperatures and the mix of freshwater from melted ice and saltwater affect undersea weapons and the sounds a sub makes (vital for knowing how to hide), as well as mapping the Arctic’s seabed topography. “In our lifetime, what was [in effect] land and prohibitive to navigate or explore, is becoming an ocean, and we’d better understand it,” noted Admiral Greenert. “We need to be sure that our sensors, weapons and people are proficient in this part of the world,” so that we can “own the undersea domain and get anywhere there.” Because if the Arctic does open up for shipping, it offers a much shorter route from the Atlantic to the Pacific than through the Panama Canal, saving huge amounts of time and fuel. You learn a lot on a trip like this, starting with the fact that I’m not claustrophobic. Sleeping in the middle rack of three stacked beds, appropriately called coffins, I now know that. More important, you learn how crucial acoustics are when operating deep under ice with no vision and no GPS satellite to guide you. Or, as the New Mexico’s captain, Todd Moore, 40, put it: It’s like every day “engaging in a knife fight in a dark room: the only thing you can do is go after what you hear.” You can’t see the adversary. You can’t see the ice keels, but you can hear enemy subs, surface ships, whales, calving icebergs, schools of fish and bounce sound waves off them with sonar to measure distances. The New Mexico not only carries supersensitive sonar but also tows a giant electronic ear 1,000 feet behind it that can listen to the ocean without interference from the sub’s own engine noise. “We can hear shrimp crackling 200 feet under water,” explained Lt. Cmdr. Craig Litty. They can also hear someone drop a wrench in the engine room of a Russian sub several miles away. You certainly learn how self-contained a sub is. The New Mexico repairs its own broken parts, desalinates its own drinking water, generates its own nuclear power and makes its own air by taking purified water, zapping it with electricity, separating the H2O into hydrogen and oxygen, then discharging the hydrogen and circulating the oxygen. The only thing that limits them is food-storage capacity and the sanity of the 130 crew; 90 days underwater is no problem. My strongest impression, though, was experiencing something you see too little of these days on land: “Excellence.” You’re riding in a pressurized steel tube undersea. If anyone turns one knob the wrong way on the reactor or leaves a vent open, it can be death for everyone. This produces a unique culture among these mostly 20-something submariners. As one officer put it: “You become addicted to integrity.” There is zero tolerance for hiding any mistake. The sense of ownership and mutual accountability is palpable. Late at night, I was sipping coffee in the wardroom and a junior officer, Jeremy Ball, 27, came by and asked me if I could stay for Passover. He and two other Jewish sailors were organizing the Seder; the captain and several other non-Jewish shipmates said they’d be happy to join, but there was still room. Ball said he’d been storing “a brisket in the freezer” for the holiday and would pick up matzo when they surfaced in Canada. Thanks, I said, but one night’s enough for me. But I had to ask: How do all of you stand being away from your families for so long underwater, receiving only a two-sentence “family-gram” once a week? Remind me again what we’re doing in Washington these days to deserve such young people?